"India's No.1 Art-Based Behavioural Training Company "
Why? Because… “The Clown Leaves Happiness Where He Goes” – Richard Nixon, 1971. Let us start at the very beginning. Every organisation knows that Happy Clients + Happy Employees = Happy Company. Most organizations have large teams working tirelessly to ensure that the first variable of the equation is handled well. But most often the second variable, Happy Employees, is relegated to second priority and taken for granted on the basis of monetary benefits. But the truth is, the key to a happy workforce that is also productive is not just about money. It is about creating an ecosystem – an organizational culture and values – that they can take pride in; that makes them feel like a part of the winning team that they would never want to quit. A large part of this is achieved through an effective internal communications strategy. Internal communications provides a constant reminder and validation of the kind of behaviour that is aligned to the culture of that organization. The information shared via internal communication could vary from the most critical to the most mundane, but every message has a purpose and is tailored to that organization’s culture and ways of working. Organizations use many ways to communicate these messages – there’s the trusty old mass email (most of which languish unread in the recipients’ inboxes for days). Then there are the departmental memos, notices, circulars (a lot of which fly right past employees’ notice); workplace posters that are fairly common in larger work areas; and at the more “fun” or “participatory” style companies, team huddles are used. Many of these conventional methods, while effective to deliver a quick message or update, suffer from the issue of retention and internalization. They do not have a lasting impact. The communication is one-way and there is no room for engagement on differing points of view. As these methods are neither experiential nor relatable, the messages often get distorted, misrepresented, misunderstood and therefore become ineffective. This risk is magnified when sensitive issues such as POSH are concerned. So what’s our solution? Stories. People remember stories – you probably understood more about the laws of physics from watching Interstellar than your high school science classes! 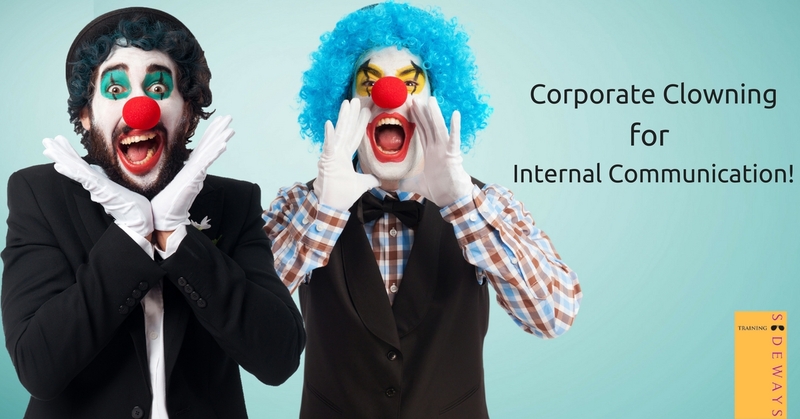 In a corporate context, organizations can tell stories in a very engaging manner using the technique of corporate clowning. Corporate clowning is a novel theatre-based methodology that is fast catching on. Whatever the nature of your communication, our theatre-trained clowns will weave a story around it and draw your workforce into it. Moving from cubicle to cubicle, department to department, they present their stories right where the employees are. Because they have humour at their disposal, they can take liberties with your message that would not have been possible otherwise – with a dash of play acting and theatre, this tool is quite handy to make employees empathize with the message and connect better with the organisation. So what are you waiting for? Just call our clowns and watch the fun!